The Arcade is Dead! Long Live the Arcade! CADRE Swap and Cooperative Gaming Coop Swap! Tuesday April 9 from 7pm-9pm in Art 241 on SJSU campus. 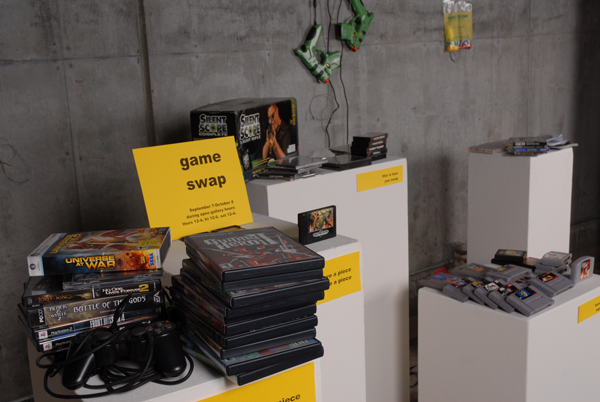 Coop Swap – bring one cool game to swap for one cool thing we have in our collection, make sure to bring something someone will want to play… that is the way the swap lives on. You are also welcome to trade with other Coopers. CADRE Swap – bring old electronics that you want to get rid of, we will put it all out on a table and you are welcome to take home whatever you like, anything that is left over will be recycled. The Cooperative Gaming Coop at SubZERO!